With the 2012/13 Serie A season just over two months away, rumours and speculation over what reinforcements Torino will make for the new season has already begun. After the departures of on loan goalkeepers Ferdinando Coppola and Francesco Benussi, one of Toro's main priorities in the summer transfer market is a keeper, with Bologna's Jean-François Gillet being heavily rumoured. Genoa's French goalkeeper Sebastien Frey has also been mentioned, but given his salary, that seems extremely unlikely. In defence, Cagliari's Michele Canini is apparently a target and would provide the defence with some much needed top flight experience. In midfield, the enigmatic Alessio Cerci (who played under Giampiero Ventura at Pisa) has been rumoured, but he is expected to feature in Vincenzo Montella's plans at Fiorentina next season. A number of South American imports have also featured in the gossip columns, with Lanus midfielder Guido Pizzaro perhaps the most likely acquisition. Up front, the name Paulo Barreto continues to come up, as it did for much of last season, and although he has played for Ventura before, his lack of football in the last two seasons would be a worry. However, if some of these players are to come in, one would expect a number of the players who helped Toro to promotion to leave the club. Speculation concerning Angelo Ogbonna has been relatively quiet, with many potential suitors being put off by his high price tag, which may hopefully mean he will stay for at least one more season. Francesco Pratali and Alessandro Parisi are both out of contract in the summer, and given their age, it is unlikely that they will be renewed for next season. In midfield Manuel Iori who impressed many whilst on loan last season will not return to the club, however Migjen Basha who was also on loan could return. Up front, speculation continues regarding the future of captain Rolando Bianchi and whilst he wants to stay at Toro, he may not fit into Ventura's plans. A fantastic season for Torino's vice-captain is concluded with him being voted the Torino FC Player of the Season by the readers of this blog. Ten points clear of his nearest rival, Angelo was the outstanding candidate for this award, and will be hoping to enjoy further success with Italy during Euro 2012. Runner up in the main award, it is Serbian winger Alen Stevanovic who was crowned Young Player of the Season by Toro fans. A fantastic breakthrough season by a player who had been struggling in the MLS with Toronto FC just twelve months previously. Although not a regular at the start of the season, Giuseppe Vives provided invaluable experience towards the end of the season and contributed a number of vital assists that led to him being crowned Signing of the Season by Toro supporters. The 2011/12 Serie B campaign has probably been one of the best in recent memory, with excitement occurring at both the top and bottom of the table. However, the season was also tinged with sadness after the tragic on-field death of Livorno midfielder Piermario Morosini in April. The purpose of this post is to look back on (and laugh at) the pre-season predictions that I made in August. 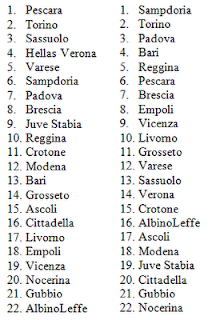 ﻿﻿﻿﻿﻿﻿﻿﻿﻿﻿﻿﻿﻿﻿﻿﻿﻿﻿﻿﻿﻿As the above tables show, my pre-season Serie B predictions were way off the mark, despite correctly predicting that Torino would finish in 2nd position. However, my prediction of Sampdoria winning the league was way off the mark, although they did regroup towards the end of the campaign to beat Varese in the playoff final to secure promotion. I had predicted a successful campaign for Zdenek Zeman's Pescara, however they exceeded the expectations of many by claiming the Serie B title in the final minute of the final match. Despite predicting mid-table finishes for both teams, Sassuolo and Hellas Verona found themselves in the playoffs, and were both somewhat unlucky to not progress to the final. 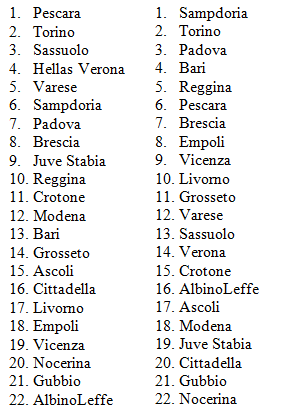 At the other end of the table, I correctly predicted that Gubbio and Nocerina would be relegated after just one season in Serie B, and AlbinoLeffe's long stay in Italy's second tier is over as they finished bottom of the league. In the relegation play-out, two sides who have recently played in Serie A - Empoli and Vicenza, battled it out to stay in the division - and it was the Tuscan side who prevailed in a back-and-forth tussle meaning that it will be Vicenza who will play Lega Pro football next season.